I'm so excited for you to meet my featured sponsor for the next few weeks, Juicy Christians! Such an amazing testimony and really gorgeous jewelry. My name is Nathifa Davis-Sligh and I am the owner of Juicy Christians, a faith inspired and inspirational jewelry company that allows believers to express their faith in style. I am a new mom to a wonderful little boy, a wife to a wonderful man and a lover of Christ! Most people want to know what being a Juicy Christian is all about. We're about being full of flavor for Christ and being bold enough to share it with the world. We want people to know that even through all the hard experiences in our lives we know that God has an awesome plan for our lives and that we are meant to live an abundant life. That's the amazing thing about our jewelry. Everyone can relate to at least one of our pieces. They speak to the stories in our lives. That is why we love what we do. Our work began in 2008 out of the sheer will to spread words that bring life to others. We are inspired by our faith, our love for fashion and interior design, and by the experiences of those close to us. Our hope is that by wearing our jewelry, you will remember the promises of God for your life. We hope others ask you about what it means to be a Juicy Christian. We hope that you use that door to share the story of your relationship with Jesus Christ with them. So, we invite you to fall in love with our pieces; we invite you to become a part of the Juicy Christians family; but most of all, we invite you to let our jewelry help you boldly share your faith with the world. 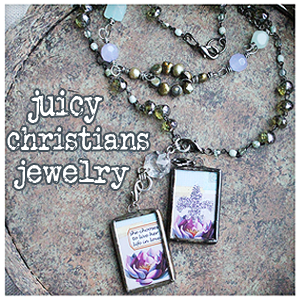 Juicy Christians is offering one lucky reader a charm of their choice. Visit their shop and let me know which one you'd pick! Giveaway winner will be announced Friday. Hey Laura! Thanks for the giveaway. :) I like the Hope charm. So sweet. Wow, thanks for this giveaway. These charms are so pretty and unique! 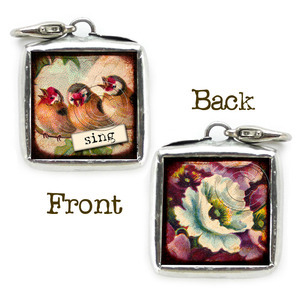 I can't decide on a favorite between two: the "sing" square charm, and the "She chooses to live her life in love" one! TOO COOL! I love the square Joy Vintage Charm - it's beautiful! Thanks for a great giveaway! Family Vintage Charm (BD101) is so sweet with those birds! I really like the sing one also and then those longer rectangle charms are so neat....gosh it's hard decide!!! keep praying and carry on piece! I love the "it is well" charm! Actually, I love them all and feel blessed that I already own one of these gorgeous necklaces. i love the peace vintage charm. this woman does amazing work and it is do meaningful. great giveaway!!! My favorite is the Love & Peace charm! The charms are beautiful! I love the square charm with the bird that says "abundance." Beautiful jewelry! I love the soar charm. I love the Grace charm! I would choose the Love Vintage charm.